Don’t let your smile come at the expense of animals–choose zero-waste dental essentials instead. He was holding a toothpick-sized, flat plastic with a serrated edge, like a paper-thin plastic steak knife. He pushed the sharp point between my teeth, saying, “This gets all the places that your floss can’t reach!” And when my gums didn’t bleed (which happens when long-term debris gets dislodged from crevices), he shrugged and said, “I guess you don’t need this,” and tossed the little knife into the garbage. I couldn’t help but cringe at that, knowing what kind of tragedy this tiny plastic knife can bring–and what will happen if dentists all over the world are now recommending this. My awakening to this problem started while watching BBC’s Blue Planet 2. Among other harrowing scenes, there was an albatross chick stabbed to death from the inside by a plastic toothpick. Months later, I saw another documentary called Albatross and encountered an unforgettable image of a beautiful, down-covered baby bird. Its stomach was cut open to reveal a bucketful of plastic junk, among which was a toothbrush. Today, more than 8 million tones of plastic a year are released into the oceans–an amount equal to a garbage truck full every minute, 24/7, 365 days a year. Of that amount, admittedly dental items such as toothbrushes and toothpicks are not the vast majority (plastic bags and plastic bottles are the top two culprits). However, their small size makes them even more lethal to marine animals and seabirds. 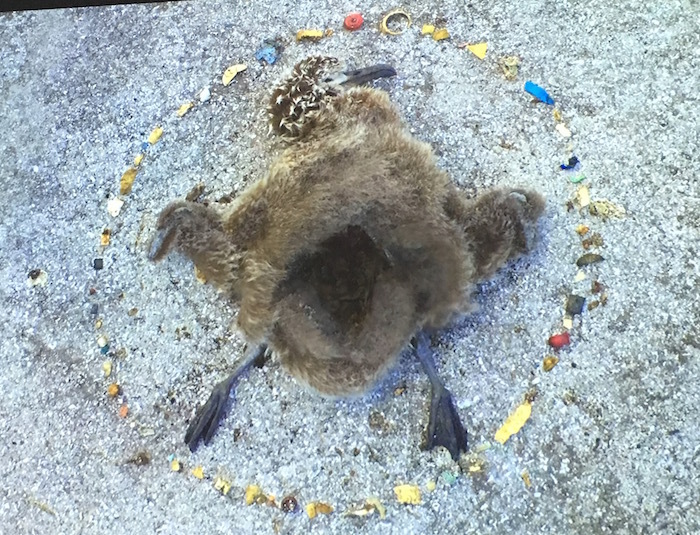 While a pelican or an albatross might not be able to feed a plastic Poland Spring bottle to its young, it sure can–and does–pass on these dental items, unaware that their loving parental instincts will in fact kill their babies. After seeing Blue Planet 2, I bought my first bamboo toothbrush at my local organic food store, but this comes with caveats, too. While the handle is biodegradable (I plan on adding this to my compost), the bristles are made of nylon, which means they have to be stripped away and thrown out. Furthermore, I noticed that the bristles have started to come off on their own, which is quite alarming when you’re brushing your teeth. This brings home the point I learned on this quest: when it comes to a fully zero-waste dental routine, we don’t have a perfect solution (yet). Whatever we choose *will* have environmental consequences, which seems to apply for anything else we must do to function in modern society. But that doesn’t mean we can’t minimize our impact. Here are some zero-waste or reduced-waste tools that keep your mouth clean. Dental Lace–Every year, millions of the empty plastic containers of dental floss are thrown away in the U.S.–enough to fill a football field that is 6 stories high. This zero-waste dental floss is the first completely biodegradable floss I’ve ever encountered. 99.99% of floss is made of nylon, which I imagine looks delectable and worm-like to unsuspecting birds. Dental Lace is made of 100% silk, so no, it is not vegan. However, between silk floss that comes in sustainable, refillable container and synthetic fiber in plastic container, I would choose the former. This is a kind of speciesism too but I do care a lot more about birds, fish, and marine mammals than silkworms and other insects. Dental Lace comes in a glass container with a stainless-steel cap and the paper wrapping can be recycled. When you’re done with the floss, you can throw that in the compost with the rest of your produce peels! Another bonus: You can keep purchasing just the refill floss. Charcoal Toothbrush–this brush is made of bamboo and comes in paper packaging. The charcoal brush is made with nylon, so please rip off before composting your stick. The bamboo is said to make this antibacterial, antifungal, and antiviral. Salt water gargle–In pre-modern Korea, people used salt baked in bamboo trunks to brush their teeth (using their fingers–nature’s toothbrush!). My dentist (the same one who wanted me to use plastic floss-knives) said that salt water gargle is the best mouthwash you can do to kill germs without eroding your enamels, as conventional mouthwashes like Listerine are acidic. Since I already know salt gargle nips any cold or infection in the bud, this is a great tip all around. Simply slosh salty water in your mouth and spit, before going to bed at night. DIY Toothpaste–okay guys, this is definitely something you need to try before you embrace. Previously, I found Tom’s of Maine Fluoride-free Toothpaste didn’t clean my mouth–and subsequently, I got cavities. Tom’s also uses plastic tubes. Some of my friends have thus tried making their own toothpaste, to varying degrees of success. There are a number of recipes here in this blog post including combinations like coconut oil + baking soda + stevia + peppermint oil, baking soda + salt, etc. If you’re not sure about that, try this Cinnamon Stick Tooth Powder with bentonite clay, charcoal, myrrh, and stevia. Sounds kind of delicious, actually. Have you tried any sustainable dental products? Thanks for the informative and helpful post. I definitely know what to add to my shopping list. It’s incredible how a small change can make a huge difference.